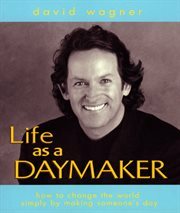 The item Life as a daymaker: : how to change the world by making someone's day, (electronic resource) represents a specific, individual, material embodiment of a distinct intellectual or artistic creation found in Austin Public Library. Daymaker- A person who performs acts of kindness with the intention of making the world a better place! You have stumbled onto a simple yet profound idea that can change your life. You don't need money, yet you provide wealth beyond your imagining. You don't have to be spiritually inclined, yet it's the ultimate spiritual behavior. You need no formal education, yet it's an act of great wisdom. Your political views don't matter, yet it can make you the most powerful person in the world. You can affect people as profoundly as have the President of the United States, the Pope, Nelson Mandela, and Mother Teresa. Because whenever you have someone else's attention your actions can convince them that the world is a cold frightening place, or that is filled with love and joy. Just be a Daymaker!